I’ve spent the latter half of this year feeling like I was waiting for my life to start again and now that I’m back in Nashville, I’m very antsy for the new year and all of its new promises. I decided to jump the gun on my new years resolution: write down what I cook every day. 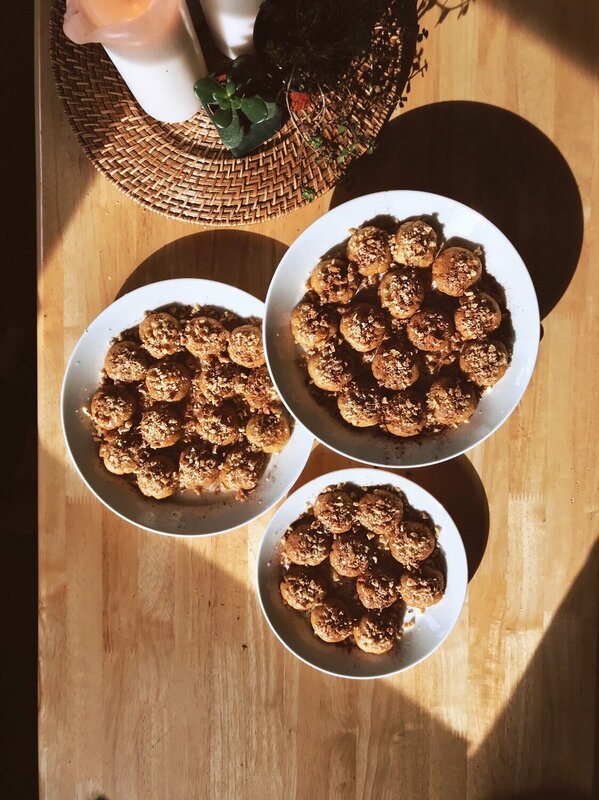 I thought I’d publish what I cook every day for a little while and see how it goes. You’ll notice that about 80% of the time, what I’m cooking isn’t exactly thrilling, but that I am doing a never-ending game of Pantry Raid with myself basically any time I’m not eating out. Leave me a comment at the bottom with feedback and as always, please be kind but very honest. So, here’s what I made for myself yesterday. I woke up so anxious I didn’t think I could leave the house and immediately started prepping food for the week, which is one of the only things in life sure to make me begin to feel at peace. I made a ginger, garlic, shallot and green onion oil, herbed tahini cream with honey, lemon and parsley, and finally, pasta dough. You may have noticed that there were extra walnuts on the plates of melomakarona that didn’t really stick, but got coated in honey syrup and cinnamon. I started yesterday by scraping them off the plate and eating them on yogurt. At lunch, I heat up homemade chicken stock with a spoonful of white miso paste, chopped sugar snap peas, roasted mushrooms and lots of green onions. It was nice and light and left me hungry not long after. Do you know about Trader Joe’s Persian cucumbers? They’re my #1 favorite snack at the moment. I especially like them in fast salads topped with crunchy peanuts, like this. But they’re also excellent for dipping in hummus, or in my case yesterday, Alouette everything bagel spreadable cheese I found in Eivind’s fridge. By 4pm I felt better, not great. Still pretty anxious. Anxious enough to be consumed by the thought of having Shake Shack for dinner and unable to leave the house to go get it. So for dinner, I worked with what I had: a tube of pre-cooked polenta, a can of artichoke hearts and butter. I pan fried slices of polenta in butter, halved the artichokes and crisped them up too, and topped the whole thing with the herbed tahini cream. Paired with the oh, so elegant, Sparkling Coconut Water with Yuzu. It hit the spot and I went back for seconds. I guess this last bit isn’t really cooking, I just want to brag on my friend Sarah Souther. I ended my night with these things she makes at Bang Candy Co. called Dream Drops. They’re pieces salted dark chocolate studded with popping sugar, laced with a hefty dose of local CBD oil and coated in a bronze shimmer. A new tradition is born! 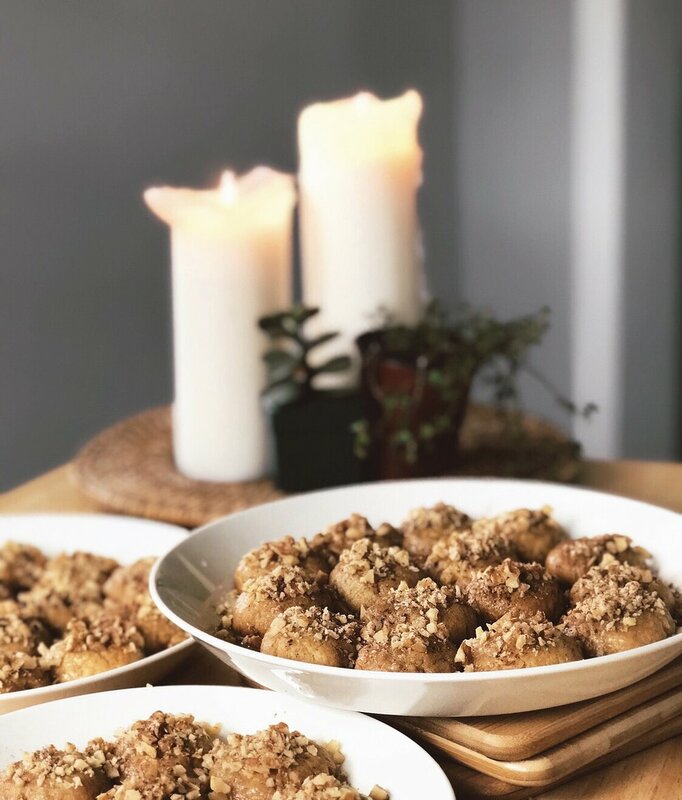 While doing an internet search for kourabiedes, the Greek cookies my family eats on special occasions, I stumbled upon several recipes for melomakarona- Greek Christmas cookies. And I simply cannot figure out why we haven’t been baking them every year. They’re simply everything you want in a Christmas cookie: citrus-y, bright, sweet, nutty and warm with cinnamon and clove. You could easily make them vegan by subbing in thick, Grade-B maple syrup for honey. You make them by throwing together the hardest, most terrible olive oil shortbread, then pouring copious amounts of spiced honey syrup over it. The little cookies eagerly drink the syrup and it gives them a soft, delicate texture. A few notes: I made them using what I had, so no, this recipe is not strictly traditional, but it is close. You can make them look more authentic by forming the dough into eggs instead of balls. They get better with time! The honey preserves the shortbread and I’ve read that they will last up to a month, though you’ll be hard pressed not to eat them all within a couple days. 1. Whisk together the oils, sugar, and juice in a small bowl until well combined. 2. In a large bowl, mix flour, baking soda, baking powder and salt. Pour wet into dry and fold together until a dough forms. 3. Refrigerate your dough for at least 30 minutes. 4. Preheat the oven to 350. Pinch off pieces of dough that are about a heaping Tablespoon in size- I believe each of mine weighed 22g. Roll into balls and press down gently on the top with a fork like you would if you were making peanut butter cookies. 5. Bake for 25 minutes or until lightly golden all over. 6. While the cookies bake, make the syrup. Bring all the ingredients to a boil, skim off any foam, then simmer for 10 minutes. 7. Arrange cookies on a vessel with a lip. While the syrup is still warm, pour it- all of it!- evenly over the cookies. 8. Flip them over to get a good, sticky surface on the top, then put them back flat side down. Sprinkle them with the crushed walnuts and a light dusting of cinnamon. Let them sit in the syrup until it’s all soaked about (should take an hour or so). *You may need more flour if your dough looks overly oily. Don’t panic if the oil separates out of the dough after you refrigerate it. Just gently fold it back in.